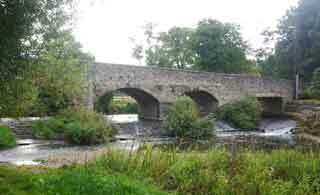 Culmstock ,split by the river Culm,is joined by an impressive 5 arched bridge dating from the Middle Ages. The village had a long tradition of cloth making with the Fox Brothers building a mill here in 1822 to spin yarn.Part of a mill can still be seen from Blackwater Road,just past the village hall. The Old Station no longer exists - it was sited beyond the Culm Valley Inn car park. This fairly easy river walk includes a steady climb and descent. There are two bridges with steepish steps. A Go up Hunters Hill with primary school on your left. Continue past the new recreation grounds,also on your left. At a road sign for Woodgate & Beacon ,take the right fork. B Continue for 790 m until - just after a bungalow on your right and before a farm - turn right onto a grassy path. If you have gone into the farm you have gone too far! C Here you will notice a gap with a stile. Continue descending until you see a gate at the bottom with hedge on right. D Turn right ,then ,almost immediately after house,turn left and follow footpath signs to the river. Cross bridge and turn right keeping river on your right. Aim towards the church. E Keep slightly to the left to a gate then up some steps . At the T junstion near the church turn right. Look out for a yew tree sprouting out of the church tower ! It dates back to around 1750. At the memorial turn left then right into Silver Street. After 470 m where you meet a track on left and a drive to Woodhayne Barton on right turn right and take the footpath on right of drive. F Caution:aim towards a line of trees (an abandoned railway line) on your left - you can walk along the river for a short while but not all the way! Keep trees on left until you join a track and follow the track until you reach Culmstock's bridge. Turn left and continue back to the school,past the pub! Although the walk contains one of the steepest climbs,the views and the well marked footpaths through rolling and remote landscapes make it a most enjoyable experience. 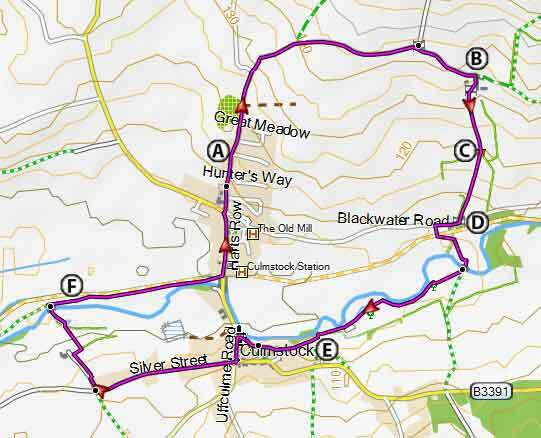 A delightful and easy walk using part of the Grand Western Canal to Holcombe Rogus - Holcombe means Wooden Valley. 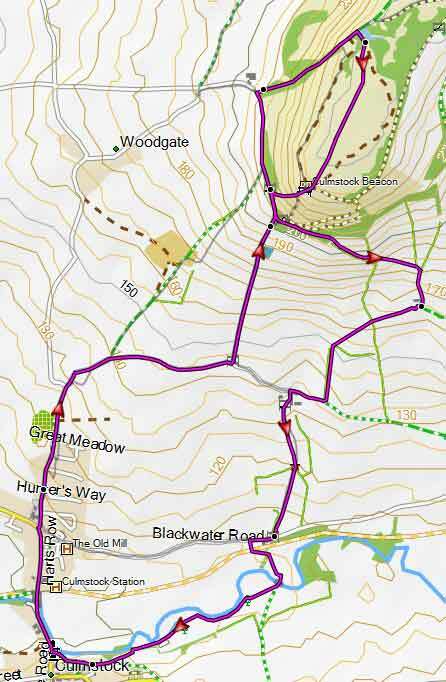 This delightful and somewhat invigorating walk starts from the village and steadily climbs up to the Beacon. It follows quiet lanes,public footpaths & bridlepaths. The beacon was used to spot enemies,ie the Armady ships .A fire would be lit to raise the alarm. There is one steady climb.